It takes a certain type of imagination to build an entire playground out of recycled 55-gallon drums, and that's exactly what students from Auburn University's Rural Studio did when redesigning the Lions Park Playscape in Greensboro, Alabama. Using 2,000 donated galvanized steel drums that had previously been used to transport mint oil, the students created a one-of-a-kind maze-like playground that promotes creativity. The playscape is the fifth phase of Auburn University Rural Studio’s effort to revitalize and redevelop Lions Park in Greensboro. The colorful, labyrinthine structure is filled with sound tubes and swing sets, and it replaces a playground that had been heavily vandalized. To create the playscape, Rural Studio welded together hundreds of metal drums, creating a maze that kids can wander through and climb on. The design studio also used the discarded drums to create a large sun screen, which prevents the playscape from getting too hot. Chicago-based structural engineer Joe Farruggia helped to construct the sunscreen. The top and bottom of some of the drums in the sunscreen have been removed, enabling kids inside the playground to look up and see the sky. Since 2004, Rural Studio has been redeveloping Lions Park, adding new baseball fields, new toilets, a skatepark, and concessions. In addition to the new playground, Rural Studio added a 1/2 mile of walking trail to the park. Chicago-based structural engineer Joe Farruggia helped to construct the sunscreen. The top and bottom of some of the drums in the sunscreen have been removed, enabling kids inside the playground to look up and see the sky. The playscape is the fifth phase of Auburn University Rural Studio's effort to revitalize and redevelop Lions Park in Greensboro. The colorful, labyrinthine structure is filled with sound tubes and swing sets, and it replaces a playground that had been heavily vandalized. 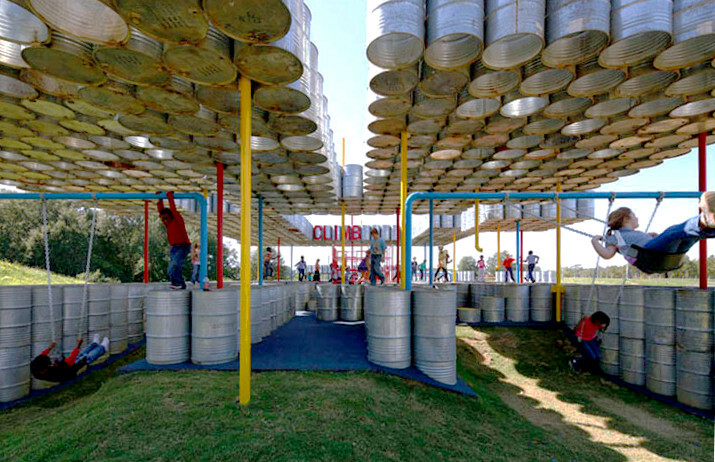 To create the playscape, Rural Studio welded together hundreds of metal drums, creating a maze that kids can wander through and climb on. 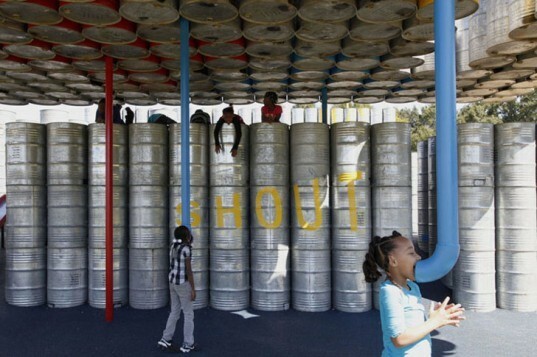 The design studio also used the discarded drums to create a large sun screen, which prevents the playscape from getting too hot.